Danze Como Brushed Nickel 1 Handle Centerset Bathroom Faucet with Touch Drain: This Danze Como Collection Centerset Sink Faucet is built to last. The highest quality standards are used to precision manufacturer a top of the line fixture. Important features of this 100% BRAND NEW Fixture: Complete Item! Everything necessary for installation is included. Brushed Nickel Single Handle Bathroom Sink Faucet - Single Handle Centerset Bathroom Faucet Como Collection Side Mount Handle w/ Touch Down Drain - The best art often uses a variation on a theme. The Como collection carries on this tradition, combining the angular look of our Sirius collection with a gracefully round spout. 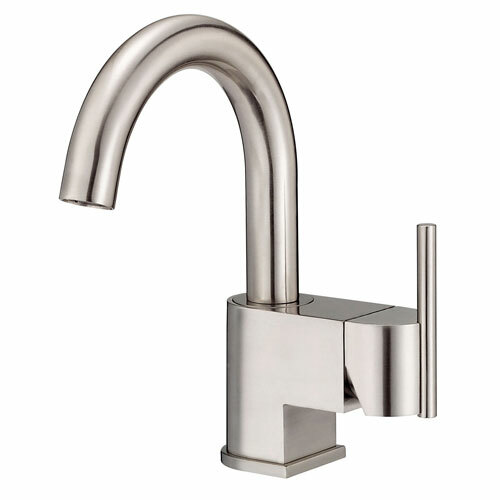 Take a look at our Como single handle lavatory faucet. It's high end style at a not-so-high-end price. - Single handle design for quick and easy water and temperature control - Ceramic Disc Valves provide drip-free shut off for life as well as smooth and easy handle operation. - Brushed Nickel premier finish designed to resist fading and tarnishing. - Brass drain assembly included for easy installation - WaterSense certified faucet helps reduce water use - ADA certified handle for universal use - Single Handle Faucet - Matching Accessories Available - Easy to Install - Installation instructions included. This fixture is manufactured by Danze and is part of their Como Collection. The best art often uses a variation on a theme. The Como collection carries on this tradition, combining the angular look of our Sirius collection with a gracefully round spout. Take a look at our Como single handle lavatory faucet. It's high end style at a not-so-high-end price.